New report reveals from racial disparities to cost burden, many trends are going in the wrong direction. Learn how MHP can increase YOUR capacity. Join our growing list of supporters! We're hiring! Lead our Capacity Team as Community Development Director! Explore upcoming events on affordable housing and community development topics! Sign up for MHP's legislative update calls, every other Friday at 10 am! Advocate with MHP at the Capitol! Read our 2019 state legislative agenda. Get the latest updates from MHP — subscribe to our email lists here. 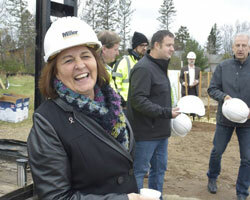 Mysa House in Mora will be the latest addition to a senior living campus established in 2009 that includes a memory care complex, independent senior apartments, and space for gatherings and community events. Read more. MHP welcomes Tasha Byers to lead the Investors Council and Kate Ingersoll to strengthen IT!